This post is a continuation of my previous post about the Marquette Opera House, taken from My Marquette. Residents near downtown Marquette were rudely woken by the fire brigade’s sirens. People peered out their windows to see an eerie conglomeration of smoke, bright red flames, and hurling white snow. The fire had begun in the Masonic Building. How it began or how long it had already raged would not be determined until much later. For now, the fire must be stopped before the entire downtown crumbled to cinders, before history repeated itself—several residents recalled their grandparents’ stories of another great downtown fire seventy years earlier. By the time the firetrucks arrived, the Masonic Building was counted as lost, including inside it, the Peter White Insurance Agency and the much-loved Opera House. Already the fire had spread along the street, engulfing Jean’s Jewelry, the Nightingale Cafe, the Scott and Woolworth stores, De Hass Builder’s Supply, and the Marquette County law library. Had electricity been required to pump water, the fire’s destruction would have been inestimable. Fortunately, the waterworks was powered by gas engines run on batteries. Hoses were quickly unrolled along Washington Street to fight the formidable fire. The bravest men struggled with feelings of panic and loss to see buildings that had stood since before their childhood, where they had spent countless joyful hours—the Opera House, the theatres, the stores—all at the mercy of the raging flames. No one had ever seen such a firestorm, much less been asked to fight it. Firemen dug their footholds into snowbanks and aimed their hoses at the flames, only to have the wind whip the waterstreams straight back into their faces, where ice formed on their noses while smoke choked their lungs. Yet they dared not back down. Bill, although large and strong for his seventeen years, had to use all his might to brace against the frigid winds and direct the hoses so the water struck the flames. Much of the water froze on powerlines and building fronts just seconds after it spurted from hoses. Heroic efforts appeared ineffective against the blazing furnace that had once been Washington Street. At times, the slush in the street was up to Bill’s hips, making him feel more like he was fishing in the Dead River than fighting a blazing fire. A firetruck froze in the slush and could not be moved. 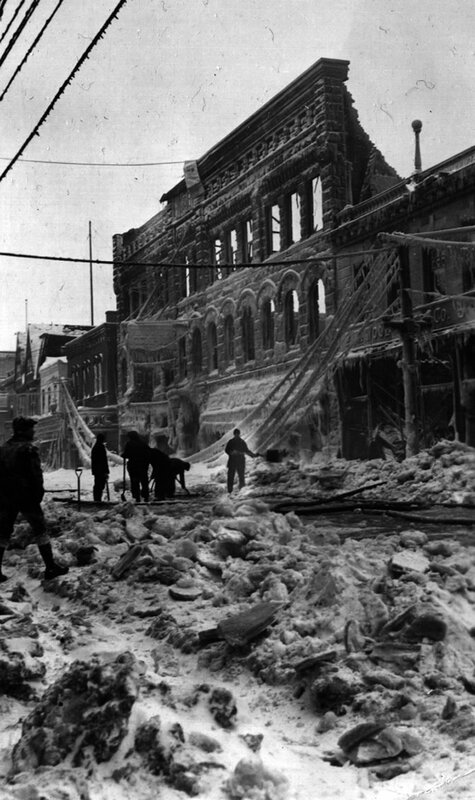 Henry waded through the watery mess to help dig out the truck so it could hose down the bank buildings on the corner of Washington and Front before the fire spread downhill toward the lake. As morning broke, Mr. Donckers opened his cafe to provide hot coffee for the firemen and volunteers. Bill and Henry took a quick, welcomed breakfast break after learning the Kresge store was no longer in danger. They emerged from breakfast, refreshed and ready to fight again, just as the west wall of the Masonic building tumbled down. Even though the wall fell inward, glass shot out from its windows, injuring a traffic officer and three firemen, while bricks struck two other men. None were seriously injured, but even the witnesses felt shaken. The accident made everyone fight with greater determination to prevent worse accidents. Curses and prayers were muttered in hopes the blizzard would end so only the fire had to be fought. There would be many more hours of frustrating toil. My only family member that I know actually witnessed the fire that day was my grandpa’s cousin, Myles McCombie. In 1999, The Mining Journal featured a story about the fire and interviewed residents who recalled it. Myles McCombie was just a teenager at the time; upon hearing about the fire, he and a friend walked downtown to see it. When they reached Washington Street, a fireman asked Myles to help for twenty-five cents an hour, so Myles picked up a hose. He told The Mining Journal, “We stood in slush up to our hips and we were pouring water on that side [of Washington] street.” Myles was also one of the volunteers who was served a quick breakfast at Donckers store when it was opened to serve the firemen. To lose a major section of downtown Marquette had to be devastating to the residents, and I can only imagine how my grandparents felt to know a place so important to them was gone forever. What caused the downtown fire that destroyed the Opera House? Stay tuned to my next blog post that will finish the story of the Marquette Opera House and the church scandal that resulted in such tragic consequences.